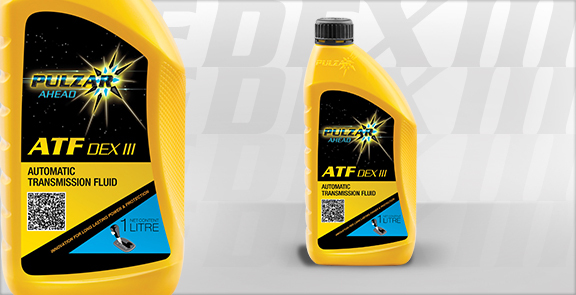 PULZAR ATF (DEX III) is a new generation petroleum base fluid for automatic and power shift transmissions. It is fully qualified as both a DEXRON®IIIH and MERCON® lubricant surpassing General Motors specification 6297-M and Ford specification 2C185A. In addition, PULZAR ATF (DEX III) is an approved Allison C-4 fluid and is qualified as a Caterpillar TO-2 lubricant. PULZAR ATF (DEX III) is especially formulated to meet the viscosity and frictional requirements of a DEXRON®III fluid. It is a multi-functional fluid that meets all FORD & GM automatic transmissions that do not specify DEXRON VI, MERCON V and Type F fluids. PULZAR ATF (DEX III) can be used in passenger cars, trucks and buses as well as off-highway construction, mining equipment, agricultural equipment, mobile hydraulic systems, industrial machinery, and power steering systems which require DEXRON®, DEXRON®-II, DEXRON®-III fluids.